I-895QW features Windows 10 Our most recent tablet is the i-895QW, which features Intel Inside with Windows 10 for improved multitasking. Keep your browser open while you Skype, and play your favorite music while you work. Intel Atom Processor The iVIEW i-895QW features the Intel Atom processor, doubling the tablet's speed and making it faster than most tablets on the market. Upgradable Storage The I-895QW has a base storage capacity of 16GB and supports up to 144GB with an SD card. Download your favorite music or transfer music from your computer to your tablet using the Micro USB cable. Listen to all your favorite songs on the go! Dual Camera (Front & Rear) to Capture Wonderful Moments Dual front and rear cameras mean you'll never miss capturing a moment. Take photographs and videos in high quality. Storage 32GB. Windows 10. 100% original and working or your money back. Good overall physical condition. NUVISION DUO 11. Use as a Tablet - For a dynamic and powerful handheld experience! Features a 10-point capacitive touchscreen with full high-definition resolution! WiFi and Bluetooth Built In. Condition is Used. Display: ST5112: 12.1” XGA 1024 x 768 TFT indoor/outdoor (Transmissive) display with greater than 160° viewing angles. 10.4" XGA 1024 x 768 TFT indoor/outdoor (Reflective FL) display, outdoor optimized. Condition is Used. Performance as a straight tablet is pretty good. I have used it for surfing the web and YouTube. The Netflix app works very well on this tablet. Storage: 32GB internal storage, with expandable microSD storage up to 32GB. Model V891w CH Dual OS. Battery 3.8V / 5800mAh. Whether it is needed for work, study or play, it will suit your all needs. It allows you to switch systems freely. Type Tablet PC. Operation system Windows 10 & Android 5.1. 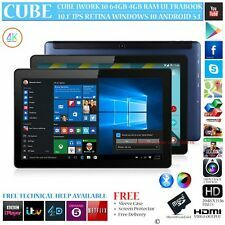 Fusion5 10.1" Windows 10 Tablet PC - (Google Certified, 32GB Storage,.... Condition is Excellent Cosmetics Good Minor Scratches . Shipped with USPS Priority Mail. Let us know what the issue is and we will help you as best as we can. This refurbished product is tested and certified to look and work like new. NuVision Duo 11 - 11.6" 2-in-1 Tablet PC with Windows 10 Home (Black) TM116W725L. Condition is Brand New. Shipped with USPS Priority Mail. No Box. But still has plastic on everything (Tablet, charger, cords). Tablet functions properly and is in very good condition. Shows minimal signs of previous use, few light scratches on the back of the tablet. The Hi10 Plus brings 1920 x 1280 screen resolution, 16:10 aspect ratio, and 350-nits screen brightness. --The Full High Definition and capacitive touch screen is perfect for whatever task big or small. New Full lamination technology, Holds glass closely Chuwi Hi10 Air adopts OGS full lamination technology to reduce the air refraction between TP and glass significantly, making the picture more vivid. CHUWI Tablet PC Docking Keyboard for Hi10 Pro/HiBook Pro/HiBook (Already Applied To It). We strive to provide the best performance in our tablets. Within our Tablet is a 8500mAh battery UN38.3 Certified to provide a long and safe battery life. The Tablet PC is less than 1/2 " thick, and weighs 3.12 lbs it is both portable and durable. Manufacturer : Juniper Systems. Warranty: 24 -Month Juniper Factory Warranty. One (1) Standard Battery. Quick Start Guide. 7" Touchscreen Display, Glove Friendly, wet condition friendly. Hand Strap. 32GB flash drive. HP Pavilion 2-in-1 Laptop/Tablet. 4 versatile modes: laptop, tablet, stand and tent. Has Wi-Fi, Bluetooth, 2 USB ports, HDMI output and headphone/microphone jack. 24/7 HP technical assistance. Nuvision 8" Windows 10 Tablet. Windows usable in full desktop or tablet mode. Connect to external display with HDMI cable (not included.). Includes tablet, original box, USB charging cable plus Fintie bluetooth keyboard / carrying case. Trimble Kenai Rugged Water Resistant Outdoor Tablet. Feel free to ask about any of our Trimble devices or accessories! Rugged design certified and tested to MIL-STD-810G standards. Microsoft® Windows® 10 Professional. This unit has minor surface scratches on the screen which dont affect the tablet's performance in any way other than being able to feel them slightly. This Motion F5te Tablet is tested working and feature the following. Every item, unless noted, is sold "AS IS" and has no. 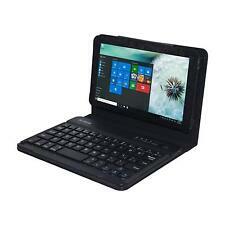 Nextbook Flexx 11A WiFi 11.6" Windows 10 Convertible Touchscreen Tablet PC. Condition is New. Shipped with USPS Priority Mail. 100% GENUINE DIGILAND PRODUCT. Model Number: DL808W. 32GB Internal Storage. Bluetooth Enabled :Yes. Internet Explorer. Micro SD Card (up to 32GB). PC settings. Built in speakers. Cell Capacity: 5000mAh Processor Model: x5-Z8350. Cell Capacity: 5000mAh: Processor Model: x5-Z8350. Touch panel module capacitive panel, multi-touch,G G. Main frequency 1.5ghz cortex-a53 core. Extend Port: Micro USB,SD Card,HDMI Feature: Ultra Slim. The Android OS version on this device cannot be upgraded or flashed and any attempts to modify the default OS will void the warranty. Multi-touch: Support 10 Point. Micro SD card slots: up to 128GB. Mic and Speaker. Tablet was manufactured early 2018. You can find more details below. Tablet is a 8500mAh battery UN38.3 Certified to provide a long and safe battery life. Product Features 4GB RAM 32 GB Nand Flash. Elite x2 1011 G1 Tablet 11.6-in 5Y10c 4GB 128GB HD Graphics 5300. P/N: L8D76UT#ABA. MPN: L8D76UT#ABA. Processor Model: 5Y10c. Solid State Drive Capacity: 128GB. Product Series: 1011 G1. Form Factor: Slate. Chuwi Model Hi10 Air. Other Model Chuwi Hi10 Air. Item Type Tablet PC. Tablet Data Capacity 64GB. Extend Port Micro USB,Dock,3G External,HDMI,Earphone Jack,OTG,TF card,Type-C. Google Play No. OS Genuine Windows 10. CPU Type Interl Gemini Lake Celeron N4000. RAM ROM: 2GB 32GB. RAM DDR3L-RS 2GB. ROM Flash EMMC 32GB. its fast read and write speeds. Panel Type: TN Item Condition: New. Cell Capacity: 7.4V/7000mAh Processor Model: Interl Gemini Lake ??. Teclast Tbook 10 S 2 in 1 Tablet PC. 64GB eMMC ROM Storage Capacity. Android 5.1 Lollipop OS. Equipped with 360-hinge, can be switched among four versatile modes, including tablet, laptop, stand and tent modes. Magnetic docking keyboard available turning this Tablet PC into a cheap laptop alternative (CVAGH-104148-KBD-ACC).